After three days of a robust up move, the Indian Equity Markets took a breather. The benchmark Index NIFTY50 showed minor retracement post quiet opening on Tuesday. The Markets pared some gains as the NIFTY ended the day losing 55.35 points or 0.52%. As we approach Wednesday’s trade, we enter the penultimate day of expiry current derivative series which happens to be one of the longest ones of the year. We expect the trade to remain dominated with rollover centric activities and also remain highly stock and sector specific. We once again expect a quiet opening to the Wednesday’s trade. 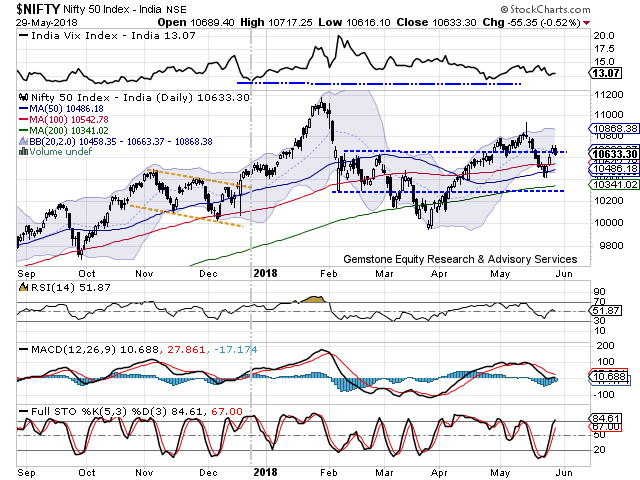 There are chances that Markets may continue to exhibit sluggish behavior with consolidation continuing though it is likely to have limited downsides with the zones of 10580-10600 acting as important pattern supports. We expect the levels of 10650 and 10710 to act as immediate resistance levels for the Markets. Supports come in at 10600 and 10550 zones. 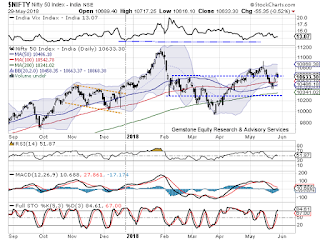 The Relative Strength Index – RSI on the Daily Chart is 51.8694 and it remains neutral showing no divergence against the price. The Daily MACD still remains bearish. However, it is seen narrowing its trajectory and in absence of any major downsides, this indicator might see positive crossover. On Candles, a small engulfing bearish candle has occurred. Though this candle is very small, relatively speaking. However, it can temporarily stall an ongoing up move. The pattern analysis show the major pattern supports of 10580-10600 coming into play once again. In event of a continued consolidation, these levels are expected to act as support in the immediate short term. Overall, in absence of any major triggers, we may see some consolidation continuing in the Markets. This activity is also likely to have very limited downsides, if any. We expect the zones of 10580-10600 acting as important pattern supports. Any further dip may see the NIFTY testing its 100DMA once again. We reiterate to continue to make select purchases while continuing to vigilantly protect profits at higher levels. Long positions were seen being added in stocks like IDEA, JSW STEEL, ADANI POWER, TATA POWER, BHEL, NCC, INFOSYS, SAIL, ASHOK LEYLAND, DABUR, M&M and LARSEN & TOUBRO.